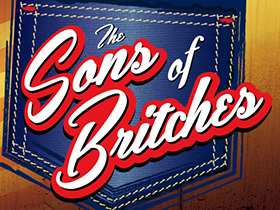 “The Sons of Britches” give the SOB moniker a whole new positive meaning, because they’re Seriously Outstanding (in) Branson! There’s nothing else quite like this show...a creative mix of musical styles; zydeco, country, rhythm & blues, Cajun, bluegrass, and rock n’ roll; it’s a tantalizing combo platter created to cater to every musical taste! With nicely tailored evening wear - you know, white tux shirts with a classy black bow tie, accompanied by faded blue overalls - these talented fellas really know how to put on a show! Melvin, Side Dish, and Squirrel Dog are ably accompanied by singer-songwriter, Plum Puddin’, and they’ll have you laughing and singing along to your favorite songs of yesterday and today. All kidding aside, these guys are great! Exceptional singers with terrific harmony and timing, and superb musicianship demonstrated on the fiddle, guitar, mandolin, and stand up bass. Get the family together and join Louis Darby, Earl Vaughan, John Fullerton, and Randy Plummer as they deliver the best music and comedy you’ll ever hear from a band of S.O.B’s - “The Sons of Britches” that is...sensational, outrageous, and brilliant entertainment!